Dimensions (HxWxD): 2" x 0.65" x 0.375"
These beautiful Egyptian Amethyst Pendulums are filled with Light & come with their own silver chains. This group of beautiful Amethyst Egyptian Pendulums have great variety within each piece ranging from deep violet to lavender hues! Each one has great beauty and fits easily in the palm. They are the perfect weight, with a tapered and elegant shape, not too heavy and not too light. 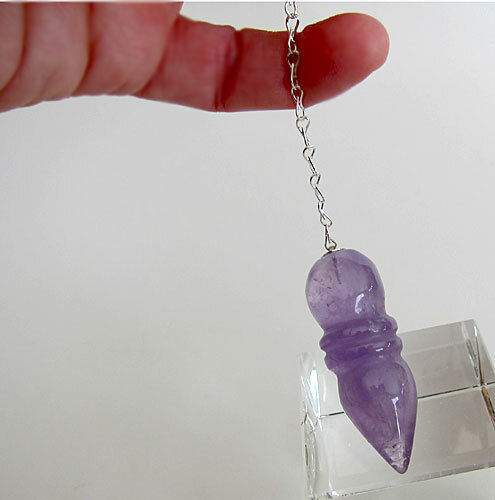 This pendulum will bring spiritual clarity and light to any question you may ask. See more selections of amethyst in our store and learn more about amethyst in our Crystalpedia section of the website. Check out the article "Using Quartz Crystals in Digital Technology, Healing and Meditation" for an overview of the metaphysical and mineralogical properties of quartz, and a step-by-step guide explaining how to cleanse, charge, and program quartz crystals for healing, meditation and other spiritual purposes. Note: the dimensions are average, each pendulum may vary somewhat in weight, color & dimensions. They are all of elegant proportions. Each pendulum is guaranteed to be beautiful & to meet with your complete satisfaction! Weight above is shipping weight. Average weight is 22 grams.